The content of this website often contains affiliate links and I may be compensated (at no cost to you!). Thank you so much for your support! As a Facebook Ads Coach I get to work with some amazing people who run awesome businesses. That’s why this month I want to share a Facebook ads success story featuring one of those awesome business owners. Deacon Hayes is the owner of WellKeptWallet.com, a fast-growing authority in the personal finance niche. Back in December 2016 we started working together on his Facebook ads strategy. Since then he’s achieved astounding results! Deacon has not only been able to exponentially increase revenue, but he’s also grown his organic reach and email subscribers by using our unique strategy. Let’s dive in and find out what’s been working and what hasn’t! Read on to find out exactly how Deacon Hayes was able to grow his revenue from $5,000 per month to $21,000 while reaching nearly 40,000 fans. Deacon first reached out to me from — wouldn’t you guess it?! — a Facebook group! I was tagged as someone who helps online experts with Facebook ads, and we had recently met in person when we both attended a conference in San Diego. At this conference, Kyle Taylor, the founder and owner of The Penny Hoarder website shared his revenue strategy of driving traffic from Facebook ads to monetized blog posts. Deacon was intrigued by this idea and wanted to test out this strategy for himself. Together, we crafted a plan to start testing out this strategy with his own blog. He started with a budget of $1,000 to use as an investment in order to test out how to drive Facebook ad costs down while increasing traffic to his website. The ultimate goal was to increase earnings with affiliate marketing and recoup the costs spent on Facebook ads. At first, Deacon wasn’t sure if he wanted to hire someone to do it for him or learn Facebook ads for himself. So I shared the pros and cons of either option, pointing out that hiring a coach (like me!) on a short-term basis means he would able to learn the strategy and then implement it. 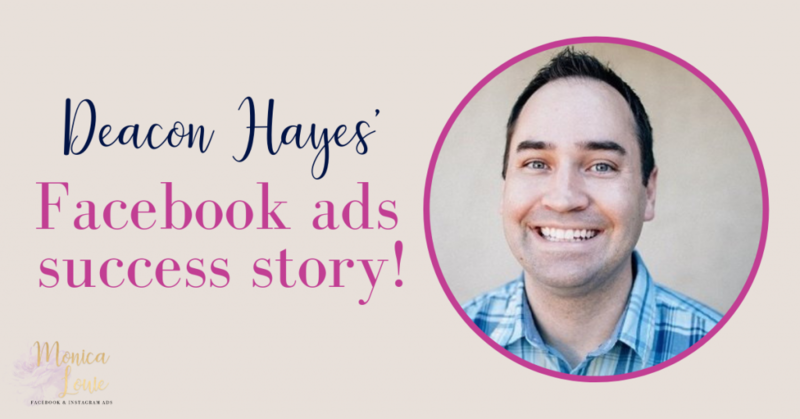 His goal with investing money into Facebook ads was to learn how to use and test Facebook ads effectively and create high-converting campaigns. So that’s when I went to work helping him craft a simple yet effective strategy. During the first month, he invested $1,000 and was able to turn that into $2,000 in revenue! If you head over to his website and view his online income reports, you’ll see the revenue he brought in during November 2016, before we started working together. Then in December, his income jumped up to $4,749 with each month steadily increasing a little bit at a time while we fine-tuned our Facebook ad campaigns. That’s the key to realizing consistent results with Facebook ads — you not only have to come up with a good strategy but consistently implement it and refine it over time. With the help of our Facebook ads strategy, he grew his Page from 3,217 fans to now approaching 40,000 fans in just 10 months! He had his Facebook Page for 6 years to grow it to 3,217 fans, and within just 10 months he grew it to 40,000. Pretty phenomenal! More Facebook fans weren’t part of the original goal so this is actually a side benefit he experienced from sticking with this long-term ad strategy. His Facebook Page has grown quickly which has also resulted in a big increase in organic Facebook traffic to his website. 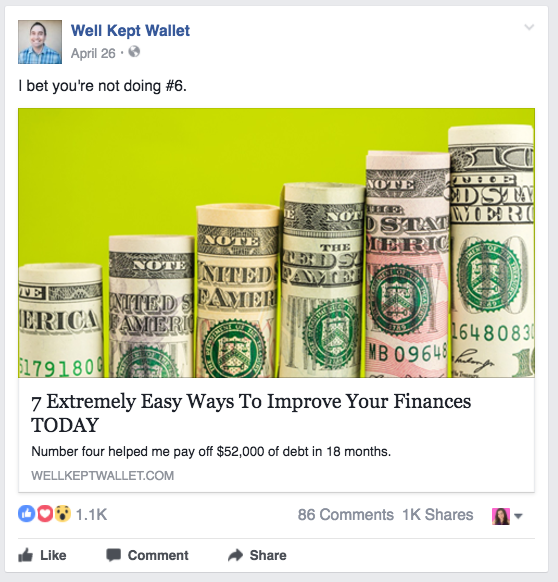 Check it out for yourself at Facebook.com/wellkeptwallet. As you scroll through the Page, you’ll see that his posts get a tremendous amount of engagement, likes, and shares. But the best part is that people are actually clicking through to visit his website. Traffic has grown because we’ve been attracting the right people who are interested in the content he shares on site. As a result, his Facebook posts get a lot of clicks, reactions, and shares. This drives quality traffic to his site and grows his reach across Facebook. Throughout 2017, Deacon’s Facebook ads strategy has been working extremely well, and in July, he spent $8,700 on ads to earn $21,000 in revenue. The best part is that as his ad costs continue to decrease while his blog income increases — meaning he’s able to pay for inexpensive (yet, quality) traffic with amazing results. His ad costs average $0.03 – 0.07 per click for Traffic campaigns! Deacon is very selective about which blog posts we use for the Facebook ad campaigns. In fact, he even created a specific Facebook-worthy blog post called, 7 Extremely Easy Ways To Improve Your Finances TODAY where each item has an affiliate link as a way to improve finances. This isn’t the first iteration of the ad, as we’ve tested different versions of the headline and the copy. What we found is that this specific combination of a bright image, plus a gotta-know headline, and compelling ad copy is what has helped this ad perform at the highest level. In addition, each item listed within the blog post is very helpful, and the content actually delivers on what the headline promises in the ad. This is something that Deacon is very aware of as he wants to make sure that each point within the blog post is something that can help a reader improve their finances quickly. There are also a variety of ways to implement one of these ideas quickly. So no matter what kind of reader lands on the post, they’re bound to find an idea that will interest them and help them improve their finances. Because of Deacon’s high level of detail, this Facebook ads strategy is a win-win-win for everyone. It’s a helpful resource for the reader, it produces income for his business, and Facebook gets rewarded with continuous ad revenue. This is just one of the campaigns that Deacon has going right now, and we’ve tested a lot of different blog posts for this Traffic strategy. The main thing is that he pays attention to important details that create a great user experience. This includes the load time for his website, making his website mobile-friendly, and removing unnecessary distractions like a pop-up window or ad networks. This is why it’s so important to have a goal in mind when starting your own Facebook ads strategy. If Deacon’s goal was to make money through email marketing, his ad strategy would be different. But since his goal is to offer valuable advice for tools or apps that help people improve their finances, he makes money when they click on affiliate links, not when they’re distracted by ads or pop-ups asking them to sign up for his email list. Removing distractions and cleaning up his website has helped increase conversions and results in more revenue. Not all of the campaigns we tried to hit it out of the park like the above example did. There was another blog post we were driving traffic to that didn’t do so well in the beginning. We turned it off and came back to it after we learned a bit more about his audiences and tested out a few other ad variations. With the new knowledge obtained from testing and tweaking the ads, we turned the “failed” campaign back on. Now, it’s become a winner and has been averaging $0.03 – 0.04 per click! The one downside to this Traffic campaign strategy is that there can be a delay in getting payment from affiliate partners. After spending a month driving traffic to a particular blog post that yields affiliate commissions, it could be 30-60 days before payment on those commissions is received. For this reason, Deacon keeps a close eye on his cash flow and ad costs. Investing too much too quickly can be harmful to his cash flow. With this Facebook ads strategy, it takes time to scale and patience to stick with a consistent Traffic campaign. You may be competing with other advertisers in the same space. Current events can drive up the cost of ads since people aren’t interested in scrolling through Facebook when they're dealing with hurricanes (for instance). There will be times of the year or seasons, where people are less interested in certain topics. As an example, January’s ad costs dropped dramatically for Deacon since he’s in the personal finance niche. This is the time of year when everyone is interested in improving their finances and getting their money in order. Obviously lowering Facebook ad costs is great, but there will always be peaks and valleys that you have to roll with. This is why it’s important to stick to a long-term strategy consistently and not make big changes within the budget too quickly. The biggest takeaway from Deacon’s success with Facebook ads is that you need to be willing to invest a bit of money upfront to get started with Facebook ads. But it doesn’t have to be a lot, and you can get started for just $5 per day, per ad. Creating a successful Facebook ads strategy to drive traffic to your website and increase revenue means having a plan and then executing it. Be open to testing and tweaking your ad strategy — especially as your business grows. 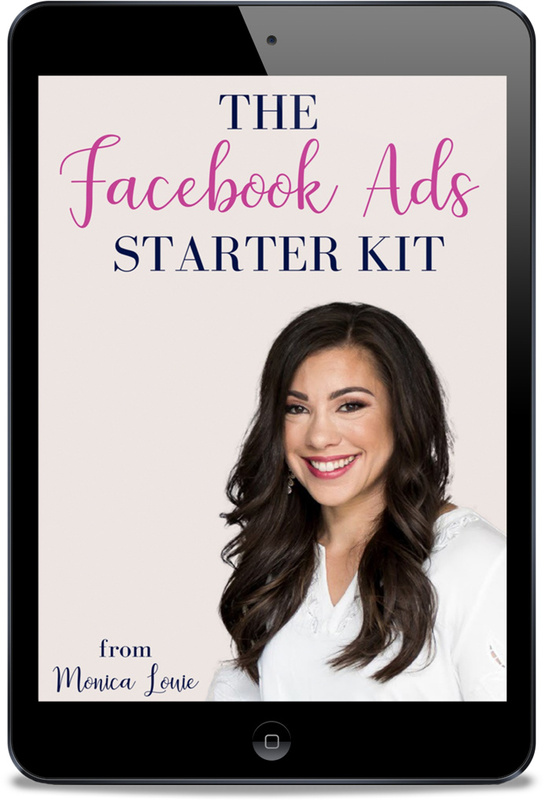 Learn more about my Flourish with Facebook Ads course so you can create campaigns that convert. Check out the course website to get started now! Get the free Facebook Ads Starter Kit today!